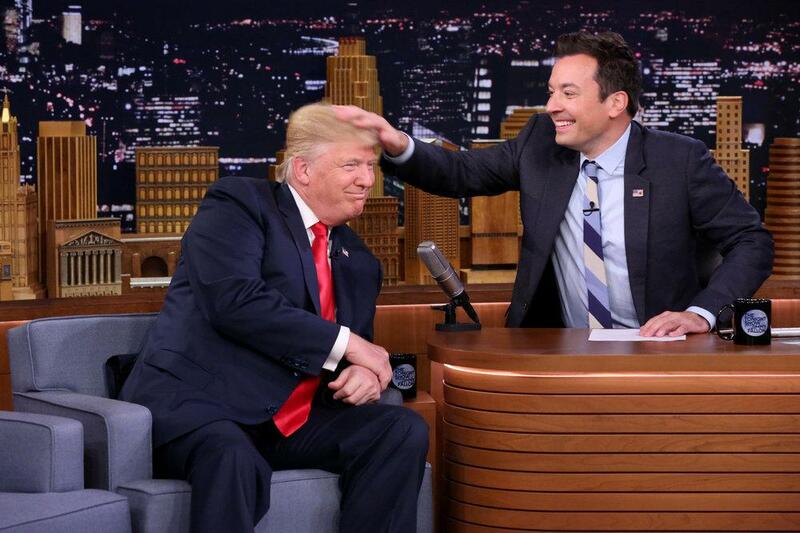 NEW YORK -- Some “Tonight Show” viewers weren’t laughing after GOP presidential hopeful Donald Trump paid Jimmy Fallon a visit Thursday, and encountered nothing hairier from the NBC host than a head rub. “I’m not liking the sound of this,” Trump said. Fallon was, both with mussing up Trump’s legendary yellow ‘do and with the interview that accompanied it. For some observers, Trump’s devil-may-care guest shot may have seemed particularly jarring on Friday as he commanded blanket TV coverage for his revised verdict, after long denying it, that President Barack Obama was indeed born in the United States. But years before the current polarizing presidential race, Fallon built his brand as a lovable, powder-puff-wielding host, no matter who his guest, politician or otherwise. No one mistakes Fallon for his slyly subversive CBS counterpart, Stephen Colbert, or Colbert’s caustic predecessor, David Letterman. Fallon’s nice-guy style has helped make him the late-night ratings leader. Democratic candidate Hillary Clinton, a scheduled guest for Monday’s “Tonight Show,” was surely expecting the same kid-gloves treatment accorded to Trump. On Friday, NBC declined to comment on Trump’s “Tonight Show” appearance.